Your first positive pregnancy test marks the beginning of years of parenting decisions–big and small–and the choice of where to give birth and with whom is among the first. If you are healthy and at a low risk of developing complications during your pregnancy and childbirth, the range of safe options to consider is wider. 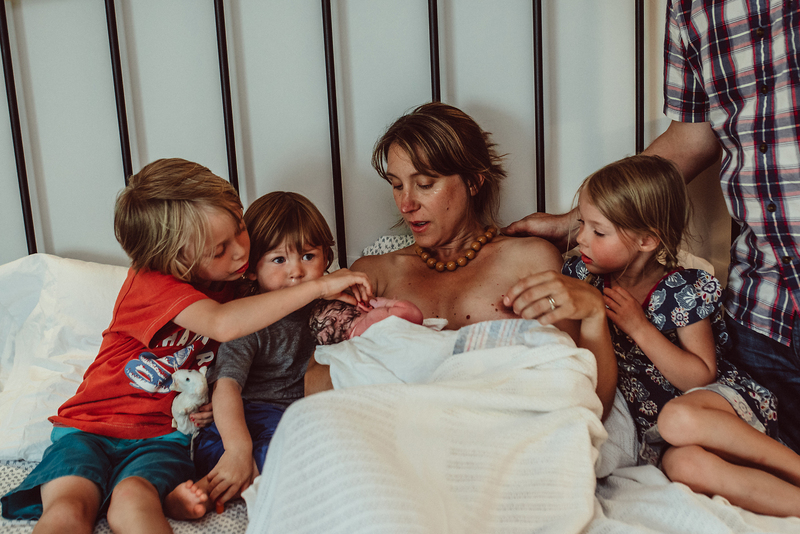 We recently had the privilege of supporting Portland writer and midwife Sam Jennings and her family as they welcomed their fourth child at the Midwifery Birth Center. After all were home and comfortable, Sam shared what influenced her decision and some other advice for women as they consider their own options and prepare for birth. Photos included with permission of the family and birth photographer Jeanette Lee Photography + Films. What were you most hoping for or looking forward to in your birth experience and how did the Midwifery Birth Center help you achieve that? As a midwife and mummy of three, birth is both my profession and my passion. Making the right choice for our family about where I would birth our 4th baby was extremely important to us. Knowing that this would be my very last labour and birth I had high expectations for this experience. I wanted it to be a meaningful, memorable pleasure for our little family. It was essential for us to have our other three kiddies present at the birth. I was so excited to see their reactions, as they all had been so excited throughout my pregnancy. (Theo and Isla had been at Indi’s home water birth two years ago in Toronto). Finding a space which would work for us in labour was essential. I loved the light filled rooms and large soaking tubs at the Midwifery Birth Center, and knew all five of us would enjoy the ample space during labour. The large rooms, kitchen area and lounge make the birthing center so comfortable, practical and user friendly for families. It allowed my labour to be family focused. These things truly make a difference when you’re trying to keep kiddies entertained for hours, and enabled us to all be together in a calm, relaxed environment. During the early stages of my labour we walked to a playground just around the corner from the birthing center. Pushing my kiddies on the swings and mobilizing during contractions. Looking back, it does seem surreal that I was six centimeters dilated and on the playground in the sunshine with my kiddies. I understand and appreciate the value of knowing the midwives who will be present at your birth. Familiarity was really important to me. The positive benefits of continuity of care provider are well known and documented. The Midwifery Birth Center facilitated this by providing many opportunities for us to meet all members of their midwifery team, during the antenatal visits and the birthing classes. I’d met all the birth centre midwives prior to labour. Michelle, an experienced midwife and mum of five, was on-call when my labour started. She offered a calm and reassuring presence throughout the day and we made decisions about my care together. Having attended births all over the world, what advice do you have for women in choosing where and with whom to give birth? As a midwife, I know that women have the best outcomes in birth when they can be in an environment that feels good to them, that fulfills all their needs. To be surrounded by the people of their choosing and supported by medical practitioners that are familiar to them makes a huge difference to outcomes. I believe women need to research all their options, and make decisions based on what feels right to them and their partner/family. Our last birth was a home water birth in Toronto, but our living situation when baby number four was due (a temporary rental home here in Portland) just didn’t feel right for a home birth. But I didn’t want to deliver in a hospital. I trusted my instincts and after lots of research I decided that the Midwifery Birth Center was the place for us. What do you wish for women who may be pregnant with their first child or preparing to birth their last? I have enjoyed four unique pregnancies and births, in terms of location, environment, country, duration, etc. But thankfully all have been low risk. The labours all progressed well and the deliveries were quick. Here are my snippets of advice for women pregnant with their first babies. Have realistic expectations about the delivery and birth. Birth is an unpredictable event. Try to keep in mind that even if the labour and delivery do not go ‘to plan’, the number-one desired outcome is a healthy mom and baby. Make informed choices. Whether it be about where you choose to give birth, the pain relief options available or infant immunizations, it’s important to make these choices based on different information sources. Read articles, ask professionals/friends, inform yourselves of current guidelines and recommendations. Consider all the information, then make your decisions. Trust your body. Your pregnant body is miraculous. Trust in your body’s abilities, its strength, its endurance to birth your baby. Think carefully about the items you truly need. With your first baby it’s very easy to be enticed by consumerism and over purchase. When I think back to the list of items I felt we ‘needed’ first time around compared to now with our 4th baby, the contrast is significant. Our family is striving for minimalism in our lives and I have practiced this in motherhood. A co-sleeper, good sling, a small quantity of clothing and a car seat is truly all we need/use/want/rely upon. Read more about Sam’s birth experience on Portland Mom’s Blog and at Little Green Lives. See more of the stunning birth photos at Jeanette Lee Photography + Films. Are you considering the type of birth experience you would like to have? Visit WHA’s Midwifery Birth Center to learn more and schedule a tour and consultation.